In 2012 the entrepreneur and tech community I started, the N.J. Tech Meetup, won the New Business of the Year award in it's hometown of Hoboken, N.J. During my speech accepting the award I talked about Hoboken as being uniquely positioned to be home to the next Google, Facebook or Amazon. We have a great standard of living, a lower cost of business than NYC, an excellent university (Stevens) in town, a vibrant tech community and obviously, a ridiculous proximity to NYC which makes recruitment and bizdev very attractive. I noticed that the mostly old-school room of business owners seemed dismissive to the reality and impact of what I was suggesting. Just a couple of years later, Jet.com set up shop in town and almost became that anchor tenant. Today it was announced that they were acquired for $3 billion by Walmart. While it seems this will provide a reasonable investor gain and some individual wealth, it’s not the outcome I was hoping for. I worry that in just a few years time Jet will be a blip on the tech radar that becomes a rounding error for Walmart with stalled innovation at that sleek three letter URL. Keep in mind -- in 2015, Amazon generated $107 billion in annual revenue and has a market cap of $363 billion. Facebook’s market cap is $360 billion. Google is $550 billion. GroupOn is $3.4 billion. WayFair is $4.1 billion. Walmart is, notably, $230 billion. The market Jet is attacking is still shockingly ripe for innovation. Ecommerce represents just 7.8 percent of retail sales. Think about that -- if you’re like me ecommerce is probably 90+ percent of your retail shopping. Yet, around the country 92.2 percent of retail still happens offline. That’s part of the market that Marc and team at Jet were aiming for. And, with the dynamic shopping engine Jet built around smart logistics, Marc was betting that the savings to customers would help expedite some of that offline to online growth and attract enough people away from the competition that growth would skyrocket. 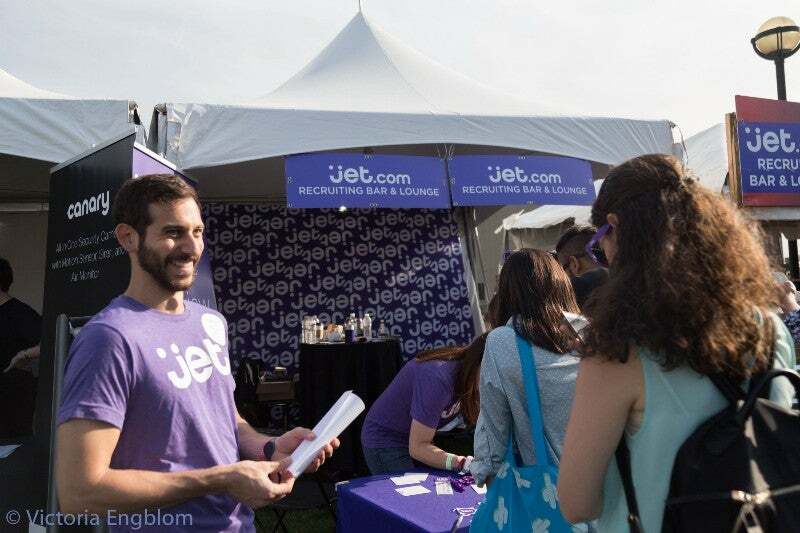 Jet.com Recruiting Bar & Lounge at Propeller Innovation Festival 2016, Pier A Hoboken, N.J.
$3 billion isn’t the rocket they intended to build. While a $3 billion sale of a few year old company is a great headline, it’s hard to imagine that’s what Marc was gunning for when he raised over $600 million. Imagine if they instead grew to a $100 billion company, acquired other innovative companies over the years and grew into a long term leader in tech and ecommerce in the NYC region. That’s a very different story. I’ve had a chance to get to know Marc a bit and have enormous respect for him. Through the N.J. Tech Meetup and with Propeller I’ve had a chance to get to know many of the very fine employees who’ve joined the Jet mission. I’m thrilled they have had a chance to get to know NJ as something other than a turnpike and a TV show. However, for N.J. and the NYC region as a whole, I’m having a hard time deeming this acquisition as a big win. What this says to me is that Amazon rules. Armed with nearly unlimited resources establishing a massive new ecommerce business with long term viability is almost impossible. I have dreamed of Hoboken transforming around companies like Jet. A tech ecosystem is not built around any one entity. Here, the N.J. Tech Meetup is an important leg of the stool. As is Stevens Institute of Technology, the Mission 50 coworking space and Jet.com. We are lacking in solid press coverage and a strong investor ecosystem, areas where my friends across the Hudson shine. Had Jet grown into the $100+ billion company we all hoped it would, Hoboken and New Jersey at large would have a modern anchor tenant that could spawn dozens of other innovators. I hope that Walmart will allow Jet to continue to innovate and push the product much further along. I hope they will allow Jet’s entrepreneurial spirit to live and encourage free thinking and boundary breaking in the way that Marc and many at Jet embody. I hope they will allow this company to thrive in a way that it will still entice people who live in Brooklyn to come to Hoboken to work inspired for Walmart, as many do for Jet, now. In the meantime, Hoboken will look for it’s next anchor tech tenant. I’m sure that among our attendees at the NJ Tech Meetup and Propeller, another Jet.com will soon be born, and perhaps decide to make it’s HQ in town too.